What Next After Failed Coup Attempt? President Ali Bongo is returning to Gabon after receiving treatment for a stroke he had in October, government sources say. It comes a week after a coup attempt was thwarted and days after he appointed a new government. Gabon's ailing President Ali Bongo has left Morocco after spending three months receiving medical treatment there, according to sources quoted by news agencies Reuters and Agence France Presse (AFP). His return to Gabon comes a week after a small military group took over a state radio station in an attempted coup. The power grab was quickly thwarted, but exposed growing frustration in the oil-rich coastal African nation over his secretive absence. Bongo, 59, suffered a stroke in October during a conference in Saudi Arabia and was flown to Morocco in November for treatment. It is not clear if he can walk, but doctors have determined that his journey back to Gabon "does not present any danger for his health," according to an unnamed government source quoted by AFP. Throughout his absence, Bongo has appeared in choreographed television clips. That included a New Year's address in which he slurred his speech and appeared unable to move his right arm. Bongo also appointed a new government on Saturday, including naming Julien Nkoghe Bekale Gabon's prime minister, in an apparent effort to shore up his political base. Gabon's constitution states that ministers must take their vows before the president, and his return could make that obligation possible. The Bongo family has led Gabon for more than 50 years. 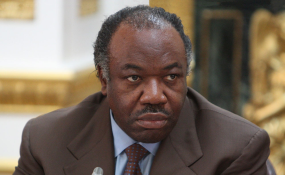 Ali Bongo replaced his father, Omar, upon his death in 2009. The 59-year-old then won re-election in 2016 by fewer than 6,000 votes amid widespread accusations of fraud. The appointment of Nkoghe Bekale represents a return to a tradition started by President Omar Bongo of choosing prime ministers from the Fang, Gabon's largest ethnic group. The Bongos, who come from a smaller ethnic group, have made such appointments in the past to broaden the president's base.